She did try and warn us. Yet four months later, in November 2016, almost 63 million of her fellow Americans voted to put the short-tempered, thin-skinned former reality TV star in charge of their country’s 6,800 nuclear warheads. Never forget: As president of the nuclear-armed United States, Trump — Trump! — has the power to destroy humanity many times over, while rendering the planet uninhabitable in the process. If that wasn’t terrifying enough, last week, less than 72 hours after the State of the Union speech, in which Trump ramped up his war of words with North Korea, his administration announced that it wanted to make it much easier for the president to start a nuclear holocaust. You might have missed that rather important piece of news. Last Friday, while cable news channels rolled on the Nunes memo, the Pentagon published the latest Nuclear Posture Review, or NPR, which includes two pretty alarming new components. Extreme circumstances could include significant non-nuclear strategic attacks. 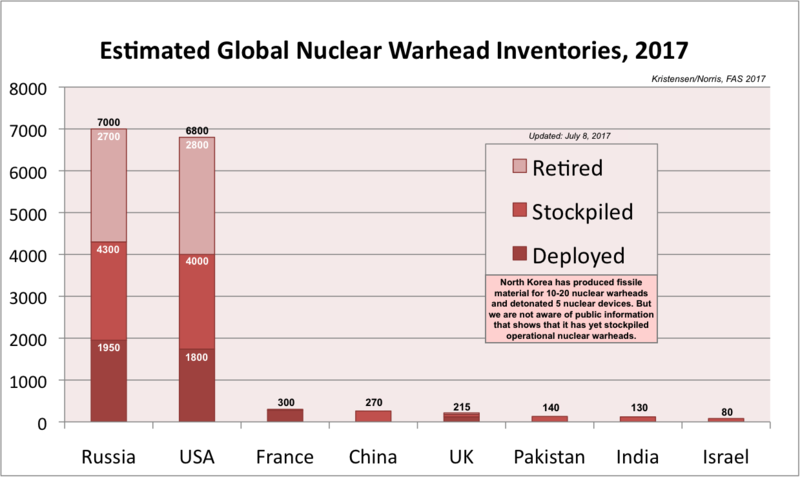 Significant non-nuclear strategic attacks include, but are not limited to, attacks on the U.S., allied, or partner civilian population or infrastructure, and attacks on U.S. or allied nuclear forces, their command and control, or warning and attack assessment capabilities. Got that? Trump wants to be able to retaliate against a non-nuclear and perhaps even non-military attack on U.S. infrastructure — say, a cyberattack on the power grid? — with a nuclear strike that could kill hundreds of thousands, if not millions. To call such a move disproportionate would be a severe understatement. Second, the new NPR calls for the development of a new generation of so-called low-yield nuclear weapons. These smaller nukes, the document suggests, would be tactical, not strategic; deployed to the battlefield, rather than dropped on a city. The problem with this argument is that the atomic bombs used against Hiroshima (200,000 dead) and Nagasaki (70,000 dead) could also be considered low-yield nuclear weapons, in terms of their explosive capacity. It would be a worrying development if any president of the United States announced, with little debate or discussion, a plan both to build more tactical nuclear weapons and use them in response to non-nuclear attacks; a nuclear strategy that makes the use of nukes more, not less, likely. But when that president is Donald J. Trump, it should be deemed a national, if not a global, emergency. Lest we forget, this is a president who, during his election campaign, displayed complete ignorance about the “nuclear triad”; called for an “unpredictable” nuclear weapons policy, while refusing to rule out using nukes against the Islamic State or even in Europe (because “it is a big place”); and asked a foreign policy adviser three times, during a single hourlong briefing, “Why can’t we use nuclear weapons?” This is a commander-in-chief, who since coming to office a year ago, has demanded a tenfold increase in the number of U.S. nuclear weapons; casually threatened North Korea “with fire and fury like the world has never seen”; and began 2018 by bragging on Twitter about his “much bigger & more powerful” nuclear button. The questions, therefore, that matter far more than any other in 2018: Does the narcissist-in-chief plan on using this “God-like power?” Will an impulsive and aggressive Trump get us all killed by launching a nuclear war? Everything else is noise.